THERE is nothing more special than to capture a moment and keep it forever. This is just what multi-awarded artist Dante Enage is doing when he opened his “Hiyum Art Exhibit: 9th Solo Exhibition” at Robinsons Place Tacloban Expansion Activity from February 6 to 13. Hiyum, which means smile in Waray, is a contraction from the name of Enage’s 11-year-old daughter Hiraya Yumi. “Most of the 40 paintings at the exhibit are about the environment to raise more awareness about environmental issues,” said Enage, 46, who also survived the 2013 Super Typhoon Yolanda. Despite the different conditions of the planet’s environment brought by man’s neglect and climate change, visitors at the exhibit are more drawn to the “unadulterated lightness...playfulness of youth, of hope, and belongingness” brought by the smiles of Enage’s daughter on the canvas. “Hiyum reveals the artist’s outlook on life: his love for environment and nature, his advocacy for culture in the hidden Baybayin texts, and his intense love for his daughter that reflects in each of the smiles displayed on every canvas,” said Aaron JP Almadro, editor and publisher of travel/lifestyle 8 Magazine in Tacloban. “The subject is obvious in all artworks, as Enage captures his daughter in various stages of pure joy, forever stilled in time,” he added. According to Almadro, the public need to see more exhibits like Enage’s “Hiyum” to counter the hate and negativity resulting from the misuse of social media, politics, and ignorance. 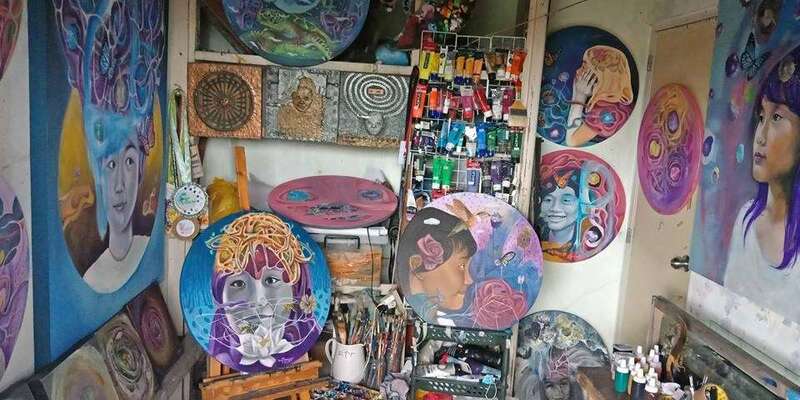 While local artists continue to struggle for the “lack of art space” in Tacloban, Enage remains thankful that the city’s art scene is still thriving. * Rayandayan, University of the Philippines-Visayas Tacloban Campus, February 9 to 22.